As a supporter of gay marriage, I can attest that too often other supporters go too far. More Americans than ever before — a record high of 60 percent, according to Gallup this week — support gay marriage. But in the wake of a new scandal rocking the academic world, it’s a good time to remind partisans and activists that the ends don’t always justify the means. This week, it was revealed that a highly publicized study — celebrated by many in the media as “groundbreaking” — was actually faked. After benign inquiry by other researchers raised red flags about the study, LaCour admitted to falsifying at least some of the results. Now Science is investigating the paper and has published an “editorial expression of concern” to alert readers to the allegations. LaCour was supposed to start teaching at Princeton this summer, but he’s no longer listed on the school’s website. Of course, faking science to change hearts and minds, no matter the cause, is a terrible idea and wholly counterproductive. 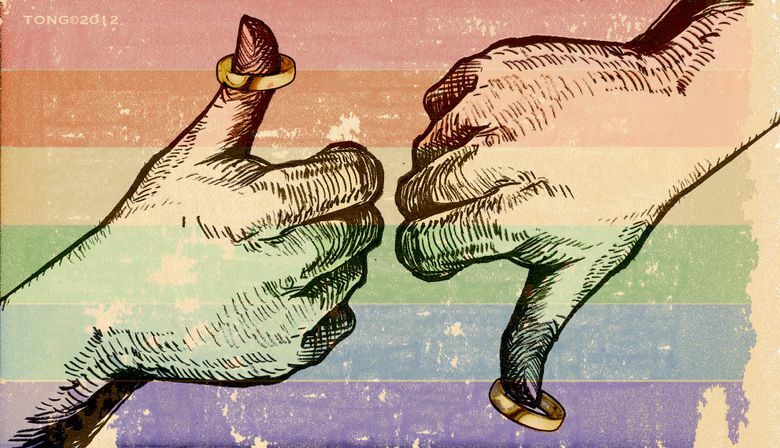 Among opponents of gay marriage there’s a growing distaste for the kinds of bullying and intimidation tactics designed to force detractors into submission. The doctored study will only encourage the perception that advocates are going too far. And, as a supporter of gay marriage, I can attest that too often they do go too far. Last year, Mozilla CEO Brendan Eich was forced to resign when the tech community found out he’d privately supported California’s efforts to ban gay marriage. The online-dating site OKCupid even blocked its website for users of the Web browser Eich created. For a group that is demanding more tolerance, the zero-tolerance policy for opposing viewpoints is chilling. The irony is that the faked study seems like an accurate description of reality, even if it can’t be quantified in as decisive a way as the authors wanted. Recently, we got the real-world embodiment of these hypotheses: Bruce Jenner. Almost 17 million people tuned in to watch the ABC special — one of the highest-rated news programs of the year on any network, according to CNN’s Brian Stelter — in which Jenner came out as transgender. Last year I met Kristin Beck, formerly Kris Beck, a U.S. Navy SEAL who transitioned from male to female in 2013. She was the first transgender person I’d spoken to at any length. Hearing her story, in her words, was eye-opening. I challenged friends who were uncomfortable with her lifestyle to watch her documentary, “Lady Valor.” Many said they were surprised by their own empathy and compassion. That’s the power of storytelling. Gay advocates don’t need to bully opponents or fake scientific studies. Changing hearts and minds happens organically — it’s not best achieved at the barrel of a gun.